I'm feeling a little better - I've finally had that massage therapy and it worked miracles for my shoulder and back pain. I will definitely keep that up and hope for a good resolution to the muscle pain. I am about the same in the breathing department (which means that I continue to be fine while I am sedentary, but very short of breath when I try to do even modest activity, like walk across the room.). I will keep you posted with the results of the tests and the next plan for chemo. In the meantime, I certainly wish everyone a joy filled holiday season. Merry Christmas. I wish that we could just "drop by" for some christmas cheer and give everyone a hug! I'm glad you are getting some relief from the massage therapy and will keep my fingers crossed for the ct scans. I'm sure the sunroom is looking great. Glad yo hear you're surrounded with love and lovely cookie smells! I hope the next round of tests and meetings bring forth an acceptable plan. Keep up that massage, and maybe do some reiki, splg?, too -I hear it really helps as well. I just love your posts. What a beautiful picture, and what great news that the massage theraphy is giving you relief so that you can enjoy your days again. 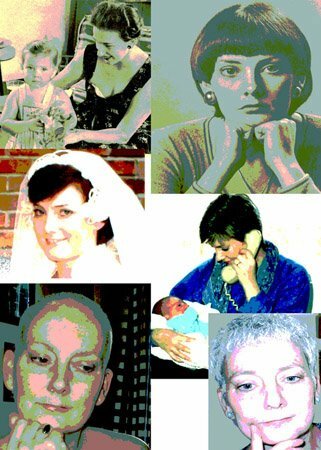 Am keeping you in prayer as you wait for a new chemo plan and CT. Also find your book reviews fascinating. You're clear about why the rating is what it is, and it makes me want to read what you recommend - also what you don't to know what to avoid. Do you have any new 'favourites?' If a person wants to read just one book for the Christmas season, what would it be? Your delight in enjoying Christmas shines through your message. Thanks so much. Enjoyed talking to you this morning Joanne. I had responded a comment at great length but it was acccidentally erased...still brushing up on the IT skills :-)!Your blog is such an inspiration to so many, including me. We will be sure to find joy in the little things this Christmas, our best presents have already arrived, including a Christmas where you are well enough to find the joy. Love Aunt L.M. Think of you often. Glad to hear your family is so supportive and you are enjoying the Christmas season. Your words are inspirational. Thanks for yet another wonderful posting. Karen, the kids and I will miss being in Regina and seeing all of you this Christmas. Best wishes for tomorrow and friday. Good to hear that you are managing to be organized and ready for the upcoming Christmas season. I wish I could be on top of things around here but as per usual I'm behind. Matthew and I have been struggling with flus and colds so that's my excuse for now. The last couple of days here have been milder and so winter is pleasant just now. 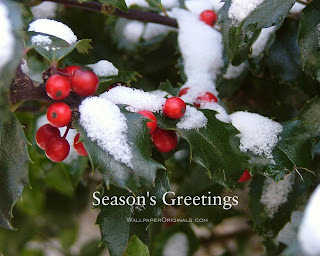 I loved the latest photo of the snow covered berries, quite lovely the colors can be this time of year. Wise of you to take the time to notice. We send you all our best for continued stability and we pray abundant blessing be your constant companion. Great picture, great attitude, and great words of wisdom. Thanks for keeping us informed. We hope you hear good news again tomorrow. We are keeping you in our thoughts! This blog is such a great idea. Thanks for your Christmas letter - mine to you was mailed the same day I received yours. It doesn't contain good news. Harley passed away July 23 so I am having a bit of difficulty this season - but you do give me strength and I thank you so sincerely for that. I love your book reviews too - I just want something I can escape into and gets me thinking of something other than myself.